Mr. K.Alung Khumba , Principal Kendriya Vidyalaya visited Germany as part of the delegation of KVS Officials from 09 June to 14 June 2014, organised by Goethe Institute & KVS. Welcome to our new Principal…! Mr. K. Alung Khumba has joined Kendriya Vidyalaya NFR Maligaon as Principal on 05 June 2012 on transfer from Kendriya Vidyalaya ONGC Sibsagar, Assam. Miss. Nilima Goswami, Trained Graduate Teacher (Biology) Kendriya Vidyalaya NFR Maligaon had served KVS for 35 years till her superannuation on 31 December 2013. Kendriya Vidyalaya NFR Maligaon family presented a citation and shawl as a token of affection and gratitude on the occasion of her retirement on 31 March 2014. Mr. Anutosh Deb, TGT (Art Education) was awarded the Pearson Teaching Award 2013. for the CATEGORY : Teaching Excellence in Art Music Drama-Government School. He was awarded byShri Kapil Sibal, Union Minister for Communications and Information Technology and Law and Justice, Mr. Deepak Mehrotra MD, Pearson India, and Indian Cricketer, Gautam Gambhir on 13 December 2013 Taj Palace Hotel, New Delhi. 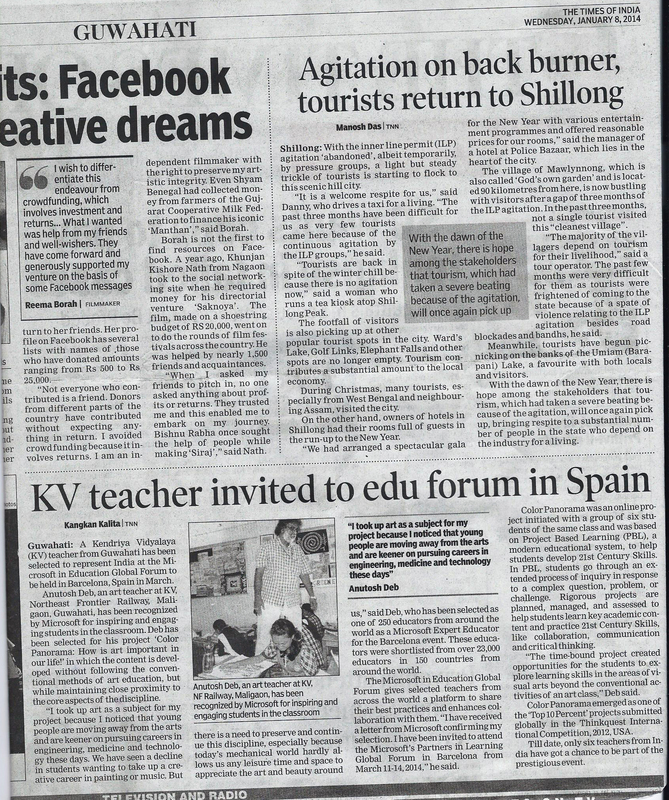 7 November 2013: Mr.Anutosh Deb, Trained Graduate Teacher (Art Education) has been selected among one of the 250 Educators from around the world and Six from India as a Microsoft Expert Educator and will attend Microsoft’s Partners in Learning Global Forum from 11-14 March 2014 in Barcelona Spain. View Microsoft Official letter Times of India news feature. ETMA (Educational Technology and Management Academy) in collaboration with Kendriya Vidyalaya Sangathan (KVS) is organizing a Pan-India Competition on School Leadership and Classroom Innovations for the teachers and principals of Kendriya Vidyalayas. This competition will help to unearth their creative talents. The future agenda of the programme is to disseminate leadership truths and classroom innovations to a larger audience so that other KVs and schools including private, Government and especially state schools can benefit. This competition is to commemorate 50th Anniversary of KVS. Mr.K.Alung Khumba, Principal, is selected from KVS Guwahati Region for the Pan India Competition on Leadership for Institution Building, Conference at Kendriya Vidyalaya Gole Market New Delhi from 14 to 16 February 2014 and the Classroom Innovation Conference at PHD Chamber of Commerce & Industry, New Delhi on 17 & 18 February 2014. Projects recommended by the Jury in the classroom Innovation in Pan-India Competition on School Leadership and Classroom Innovations conducted jointly by Educational Technology and Management Academy in collaboration with Kendriya Vidyalaya Sangathan. Mr Anutosh Deb, Trained Graduate Teacher (Art Education), is invited to attend the Classroom Innovation Conference at PHD Chamber of Commerce & Industry, New Delhi on 17 & 18 February 2014. Mr. Ravi Shankar Khakhlary, has joined Kendriya Vidyalaya NFR Maligaon as Vice-Principal on 19 April 2013. Mr Khakhlary joined KVS on 02 September 2002 as PGT-English and posted at K.V.Umroi Cantt. Shillong, Meghalaya, from where he was posted as Vice-Principal through Limited Departmental Examination 2010-2011. Seen in the picture with Mr.K.Alung Khumba, Principal K.V.NFR Maligaon. 2012: KENDRIYA VIDYALAYA NFR MALIGAON SECURED THE FIRST POSITION IN GUWAHATI CITY AT THE NATIONAL WILDLIFE QUIZ. Mr. Anutosh Deb, TGT (Art Education) õf this Vidyalaya has been awarded in Digital Still Photography & Videographyat the ALLINDIA DIGITAL PHOTOGRAPHY/VIDEOGRAPHY CONTEST FOR TEACHERS (2011) organised by Central Institute Of Educational Technology(CIET), a consitituent unit of NCERT results.